Through the years, the Northwest Georgia Joint Development Authority has worked hard to identify those businesses and industries that will provide top-level jobs for Catoosa, Chattooga, Dade, and Walker counties and be compatible with our existing business and industry that form the backbone of our region's economy. and our regional economic development allies to aggressively recruit companies within clearly defined targeted business sectors. 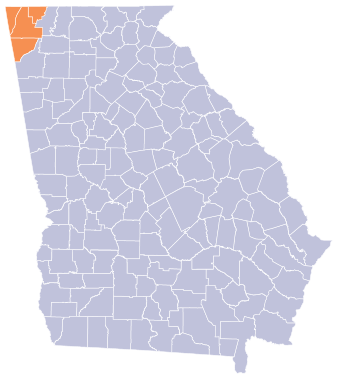 In addition, the Northwest Georgia Joint Development Authority works closely with site selection consultants to contact and sell to those regional, national, and international prospects that will consider our market in the years to come. Develop and provide comprehensive economic development and business intelligence needed by site selectors and corporate decision makers. Expand and improve a compelling web presence to provide required information on a 24/7/365 basis. Develop and implement customized marketing materials and promotional campaigns aimed at the targeted business sectors. Conduct annual business prospecting missions and trade events to engage site selection consultants and prospects. Host regional events to attract national, statewide, and regional site selection consultants and targeted prospects to Northwest Georgia. Partner with our "sister" economic development agencies in Alabama and Tennessee to effectively market our tri-state region. The Top of Georgia publishes a quarterly newsletter that features economic development success stories and news from around the region. To view our latest newsletter, please click here. You may also subscribe to our newsletter to receive the next issue. © 2019 Copyright Top of Georgia, Inc.